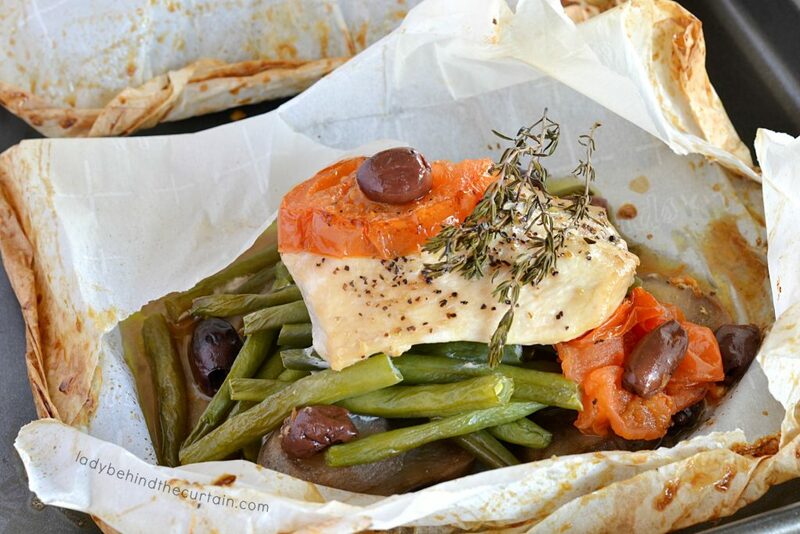 Baked Chicken in Parchment Paper | Juicy chicken breasts baked in packets of parchment paper filled with fresh herbs, potatoes, green beans, olives and tomatoes. This all in one dinner is easy to make for busy weeknights and impressive enough for dinner parties. 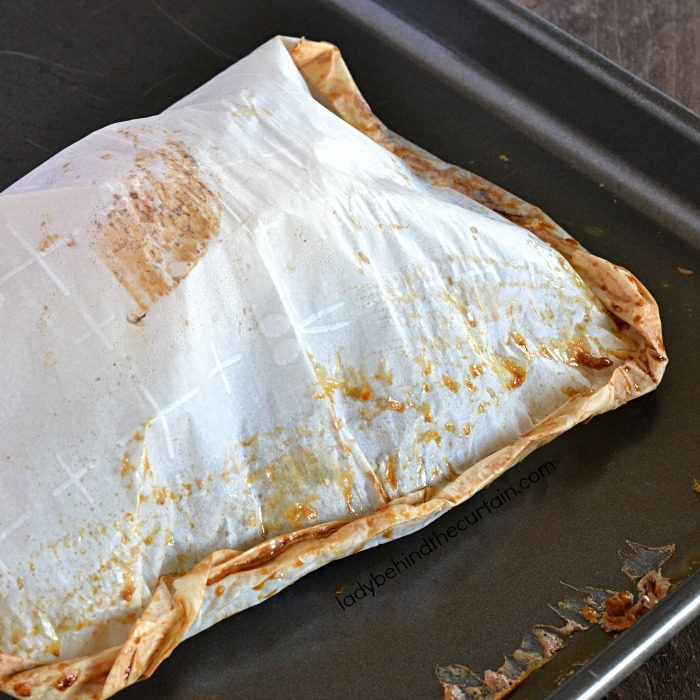 By baking the chicken, vegetables and fresh herbs in parchment paper you are creating a package that will keep all the juices and heat inside. No more dry chicken! 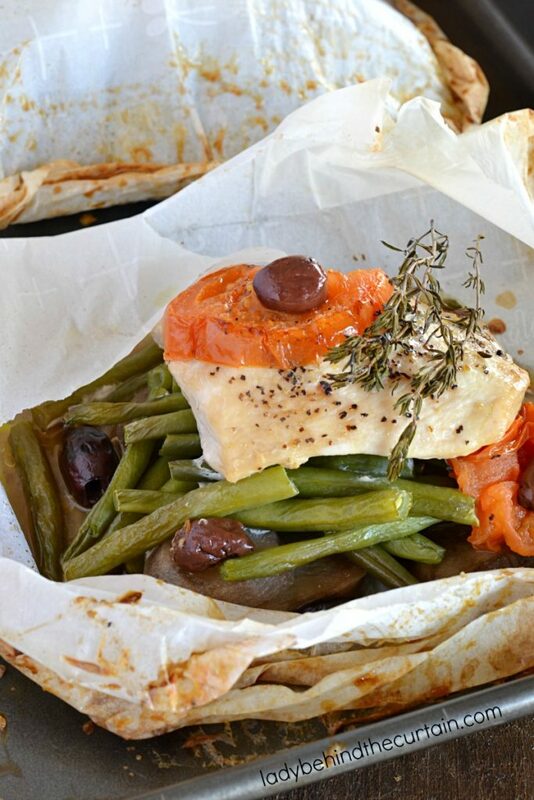 The Baked Chicken in Parchment Paper is easy to put together and makes a beautiful presentation. Serve the whole packet. Have your guests or family cut a X in the center, pull back the paper to reveal a delicious juicy piece of chicken with all the fixings! Parchment Paper verses Aluminum Foil: When it comes to baking I always grab parchment paper. While foil is great for clean up the non stick factor is not there (unless you use non stick foil). Whether I’m roasting vegetables or baking cookies I love the way parchment paper allows for what I’m baking or roasting to become brown and is always non stick. For this recipe the parchment paper also can withstand the moisture and will not tear. Don’t you just love being able to serve something that looks elegant but is super easy? 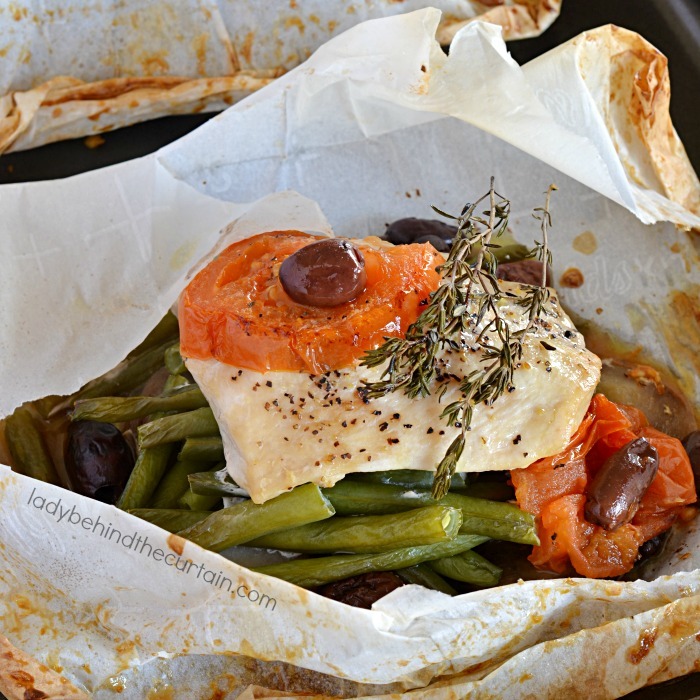 That’s exactly what this Baked Chicken in Parchment Paper is! Take the stress out of entertaining! Shhh……I’m going to let you in on the secret! This elegant dinner can be made in advance! That’s right! You can serve a nice dinner and still enjoy your guests! Put everything together earlier in the day, store in the refrigerator and when ready place it in the oven. Make sure to give the packets a little extra baking time. Since all the ingredients will be ice cold they may take a little longer to come up to temperature. But that’s okay because you’ll be relaxing and enjoying your guests! Boil potatoes in salted water until tender. Boil green beans in salted water 5 minutes. Drain both and cool. Slice potatoes and tomatoes ¼-inch thick. Preheat oven to 450°. Cut 4 pieces of parchment paper into 34x16-inch pieces. On a flat surface, lay the parchment paper. In the center of half of the parchment paper place a single layer of potato slices (about 1/2-inch larger then the chicken). Add a layer of green beans. Add chicken breast on top of the vegetables. Layer sliced tomatoes, add olives. Drizzle with olive oil. Sprinkle with salt and pepper. Top with thyme. Use a pastry brush to brush egg wash along edges of the paper. Fold the paper in half over the chicken and vegetables. Crimp the edges to seal. Add another layer of the egg wash to ensure the edges will stay closed. Repeat on the other three packets. Place each packet on a baking pan (2 per pan). Bake 40 minutes. Cut an X in the center of each packet and serve. More chicken recipes you might like. BAKED LEMON CHICKEN and CREAMY GARLIC CHICKEN.